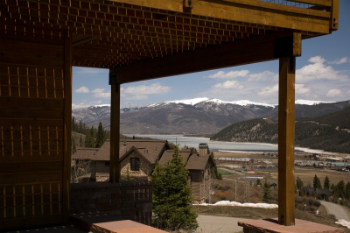 Any Highland Meadows homes for sale will lie in a neighborhood centrally located in Summit County between Frisco and Breckenridge near the junction of Highway 9 and Swan Mountain Road, which leads to Keystone and Dillon. Situated on an upslope near the base of Peak 4 in the Tenmile Range, this relatively new neighborhood has views toward Mt Guyot and Baldy and glimpses of Grays and Torreys – 14,000 foot peaks in nearby Clear Creek County. Highland Meadows is served by its own special district, Alpensee Water District that assures water quality and relieves the homeowner of that burden. Most subdivisions of larger lots in Summit County use an on-site well and septic system. Start your search with the Highland Meadows real estate listings below, or find out more about this beautiful community. Highland Meadows’ western boundary is national forest, and eventually the spine of the Tenmile Range. The bike path and Highway 9 lie to the east, so getting to town or the backcountry is easy from this neighborhood. Mountain biking, hiking and cross-country skiing are available from the doorstep and the sun will arrive at Highland Meadows early in the morning. The Blue River and lake Dillon are just across the highway from this neighborhood. The neighborhood wasn't developed until after the Summit County High School was built at Farmers Korner (finished in 2000), so any home for sale in Highland Meadows will have been built after 2001.